Since I moved to Hong Kong, I always look out for spacious dining establishments. Be it a bar, a cafe or a restaurant, a spacious one is a precious commodity in Hong Kong. Those well-versed with the local property market will know what I mean; else, allow yourself to laugh and cry at the same time at this satire on the crazy real estate that is Hong Kong. In my quest, I have encountered a number of bars/restaurants with open space here, but you could count them with one hand. The patio at SML, the bankers’ hive at SEVVA, the media’s hangout at Sugar, the rooftop bar at Crowne Plaza… see, one hand. 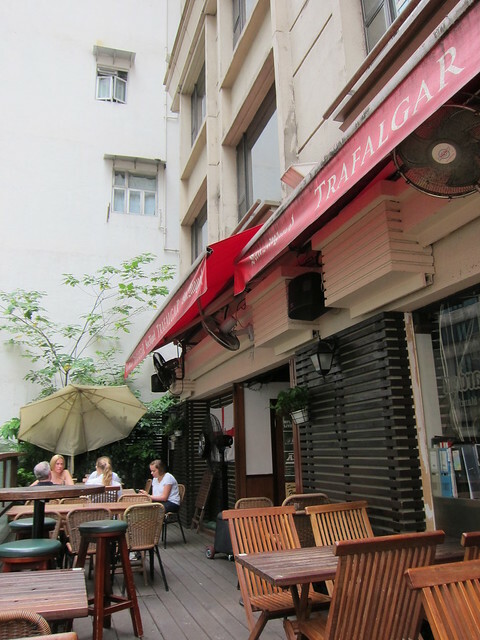 Therefore excuse my enthusiasm when I discoveredthe British pub Trafalgar located at the infamous Lockhart Road at Wanchai. As you make your way to the building (Trafalgar was located at a respectable 5th floor), allow yourself to be jostled, appraised, hustled at (if you look rich) or frowned upon (if you don’t). Lockhart Road is lined up almost entirely by bars and pubs of the girlie variety… if you get what I mean. But of course you do. I was there on a Sunday afternoon and already the various bars were doing brisk business. To say I was delighted to have this oasis of calm in the midst bustling Wan Chai would be an understatement. Trafalgar was complete with a beer garden balcony, decked out in all its wooden glory with rickety chairs and wobbling tables. You would think I am being sarcastic, but I am not. I was charmed. If I could just ignore the endless babbling of the drunk woman at the next table (slow down on the white wine, honey), I could just close my eyes and imagine myself in London. And so, on to the delight that was Trafalgar. I was there for a Groupon deal, which was an all-day brunch with three hour of (hic!) unlimited champagne, wine, and soft drinks. You might thought the food would be ordinary, since this was a Groupon deal – I won’t blame you, I went completely without expectation – but boy were my better half and I in for a pleasant surprise!